Reviewed as lossless wav download. These concertos reportedly represented a voyage of delighted discovery for the musicians of Café Zimmermann and they will do so for any lover of baroque music who hears this recording. You may know Geminiani’s earlier sets of concertos (Op.2 and Op.3, 1732 and 1733), the orchestrations of his own Op.1 and Op.4 sonatas and those of his teacher and model Corelli’s Op.5. The mid-price Academy of Ancient Music recording of Op.3, with Christopher Hogwood and a distinguished line-up of soloists remains well worth having – review – as do another Decca Oiseau-Lyre recording of his Op.5 sonatas, download only, and a more recent Linn recording of Op.5 – review (NB: catalogue number now BKD251) – but the Op.7 set outshines them and, indeed, outdoes even the music of Corelli, in originality. The music fully merits the epithet apparently given to Geminiani by his students, Il Furibondo, furious, infuriating or madman, but one with lots of method in his madness. These astonishingly good concertos couldn’t have better advocates than here – they will certainly be forming part of my regular listening from now on. If the pomegranate on the cover is meant to signify virility and fecundity, as it did in classical Greece, it's certainly an appropiate omen for these performances. Hitherto my go-to Geminiani recording of preference has been Andrew Manze’s of the Concerti Grossi arrangements of Corelli’s Op.5. Such arrangements were common at the time, and Geminiani’s own sonatas were arranged as concertos by Charles Avison (Avison Ensemble, Divine Art DDA21210 – review – DL Roundup 1) but the Op.7 works are original, and often strikingly original, compositions. The only rival complete recording, as far as I can see, comes from Capella Istropolitana on Naxos 8.553020, with Op.3/5 and 6, dating from 1998. Like most of their recordings which were made in the early days of the label when it was available in a browser in Woolworths for £3.99, taking pot-luck for what the salesman had recently left, apparently at random, these are reliable accounts, with the orchestra reportedly given plenty of time to rehearse. They were good value when they were super-budget offerings but now that Naxos is not so inexpensive, they are outperformed by the new Alpha, which costs little more, especially as the download of the new recording can be obtained for around £7.99). 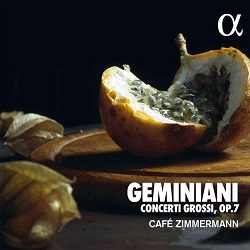 Op.7/4 and 6 can be found on an album entitled Der Zauberwald, on which the main item is a performance of Geminiani’s La foresta incantata (The enchanted forest: Capriccio C67081, La Stagione Frankfurt/Michael Schneider). Well worth having for the main work but it will tempt you to obtain the complete Op.7, so one to stream, perhaps. Like Handel, Geminiani settled in London, where these concertos were first performed in 1746. At the time it was Bononcini who was regarded as Handel’s rival – famously regarded as ‘Tweedledum and Tweedledee’ – but for my money these works rival Handel’s Op.6 set of concerti grossi, which had been published a few years earlier. Regular readers will know that I am not alone in my admiration for the recordings of Café Zimmermann. They take their name from the coffee house in Leipzig where many of Bach’s secular works were performed, so it’s hardly surprising that their six CDs of JSB’s concertos for Alpha should be such a success. They were reissued in November 2018 in a 16-CD gathering of the ensemble’s recordings to date for Alpha (ALPHA434, target price £31). Bach (JS and CPE, instrumental and choral) are far from their only repertoire; their Vivaldi L’Estro Armonico reminds us that they are also fully at home in the Italian repertoire (ALPHA193 – DL News 2015/4). They have also recorded Avison’s concerto arrangements of Scarlatti sonatas to very good purpose (ALPHA315, mid-price – review). Both the Vivaldi and Avison are included in the new box set, along with JS and CPE Bach, D’Anglebert and a CD of Cantates et Concertos comiques. Though they are here exploring these Geminiani concertos for the first time, they do so in the most convincing way in performances which outshine those on Naxos. It’s not a matter of tempo, mostly within a whisker of those of the Capella Istropolitana, more that Café Zimmermann allow themselves to be less cautious and let themselves be taken along by the music. To put it crudely: on Naxos the music doesn’t seem sure where it’s going; on Alpha it’s on its way there with assurance and it takes us cheerfully along with it. Even the Hogwood recording of Op.3, which you may have obtained as part of Decca’s erstwhile Baroque Era 50-CD budget box2, sounds a little tentative by comparison with Café Zimmermann in Op.7. That’s partly because the music is more adventurous, but it’s also a measure of how far confidence in playing period instruments has come. I first heard this recording as streamed from Naxos Music Library, where it’s available complete with the pdf booklet. Subscribers can hear it there alongside the earlier Naxos listed above. I was so impressed that I requested a lossless version of the album – the Outhere group’s own press previews come only in mp3 and at a low bit-rate. My thanks to Matt Groom at their UK distributor, RSK, for his good offices in obtaining this and other recent recordings in CD-quality sound. As heard thus, the recording amply matches the quality of these committed performances. All in all, this should shake up any misconceptions about baroque music sounding sedate. It’s also the ideal introduction to Geminiani. 1 The link to theclassicalshop is now superseded by the link to its successor, chandos.net, but that and most other downloads in lossless sound won’t save much over the cost of the 2-CD set. 2 Volume 1, which doesn't include the Geminiani, remains available to download; though no longer so inexpensive, it remains good value at around £40 (mp3) or £50 (lossless) for 25 CDs.